Women's Justice Institute — M. Harris & Co. 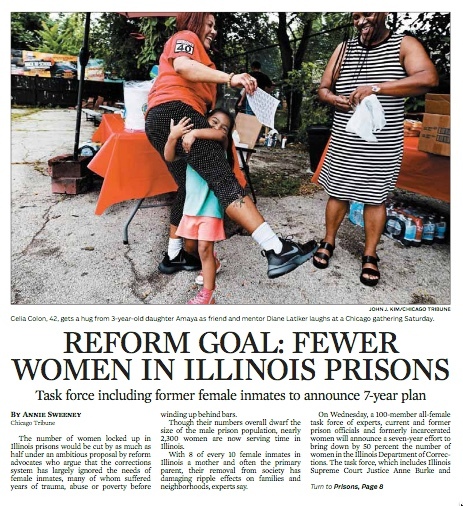 In Spring 2018, the nonprofit Women’s Justice Institute hired M. Harris & Co. to launch its campaign to cut the number of women in Illinois prisons in half. The launch was timed with a press conference at which Illinois Supreme Court Justice Anne Burke, Cook County State’s Attorney Kim Foxx and Illinois Comptroller Susana Mendoza all spoke in support. That morning, M. Harris & Co. placed this story on the Tribune’s front page, which spanned three pages. The coverage also included this video, produced by the Tribune’s digital staff. In total, the Institute received coverage in about 10 newspapers, two TV stations, news radio and on NPR stations statewide. A reporter at every newspaper in Illinois received a customized pitch under embargo, which included quotes from taskforce members residing in that reporters’ local community.